This is something we believe in strongly too, and we are passionate about our location here in Buckinghamshire and the Chiltern Hills. An Area of Outstanding Natural Beauty, with chalk hillsides and ancient woodlands, the Chilterns was once known as the ‘larder of London’ and we are proud to be one of the many excellent producers in the area and to source many of our ingredients from this corner of south east Britain. We source the majority of our meat (particularly our pork, beef & Lamb) from Jon Wilkins, a butcher in Brill. 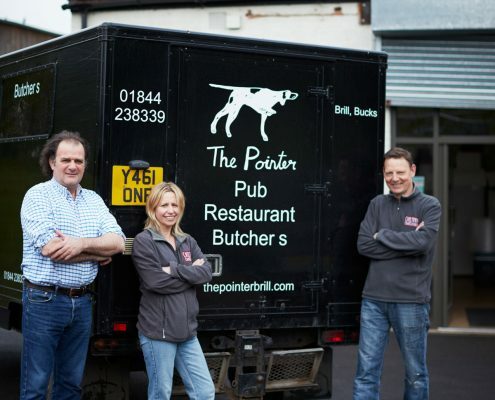 Part of the award-winning The Pointer restaurant in the Buckinghamshire village, Jon is passionate about providing high-quality, locally-reared meat not just for the restaurant and local suppliers (like us) but for the public too, in his atmospheric butcher’s shop that has been open since 2004. Jon not only butchers and supplies our meat but helps to rear it too. 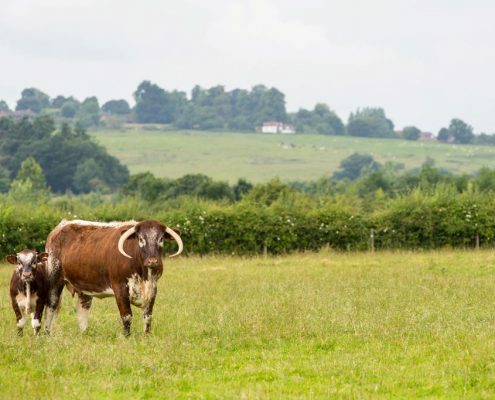 With the help of Jamie Brewer, Jon has built up a thriving herd of English Longhorn cattle, one of the country’s most ancient and traditional breeds that slowly-reared provides exceptional beef. We use Jon’s pigs too in our charcuterie products, as again these traditional breeds provide better taste with a greater layer fat, which is what makes our pancetta and chorizo so delicious. As part of the cure in our air-dried venison, we use sloe gin made by Old Luxters. Based in the Hambleden Valley, just north of Henley-on-Thames, Old Luxters has been family run since 1980 and they believe passionately in providing products of the highest quality. With an on-site winery (the vines were first planted in 1982) and brewery, they produce a range of award-winning English Wines and beers, all from a collection of historic farm buildings. The Sloe Gin, part of a range of liqueurs produced on-site, is warming and quintessential English in taste.